I’ve seen several articles lately that offer tips for those whose New Year’s resolutions include reading more books. A common thread: suggestions for what to read, or who to follow to get ideas what to read. That’s not the problem I have. I have stacks of books I want to read. The problem is time, not inclination. The problem, I’ve started to realize, is that I want to set aside large blocks of time to read properly, but I don’t have large blocks of time that don’t have something else that needs to be done. That, and overcoming inertia when I’m already distracted by the internet, where all the articles and streams are more suited for short blocks of time (but include a hook at the end to keep you going). What I need to do is just grab a few pages here and there when I can. It may not be as satisfying as sitting down with a book for an hour or two, but at least I’ll get through it. This entry was posted in Life and tagged Books, new years resolutions, reading on January 10, 2015 by Kelson. 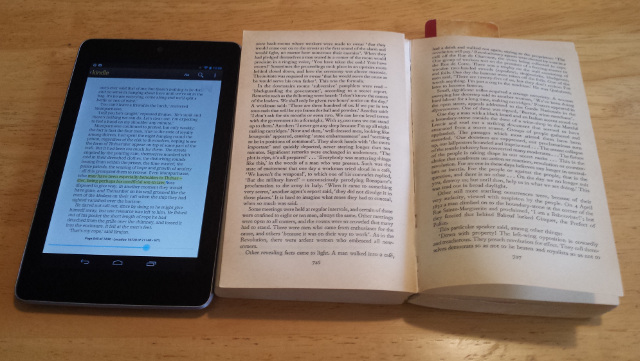 Reading, Online vs. Off…or is it Screen vs. Print? Now the Washington Post reports that people are observing a spillover effect, with online skimming habits interfering with concentration when it comes to more in-depth reading…even when reading print. Online skimming of casual articles and social media on screens. Serious reading of novels and in-depth content in print. There’s nothing to distinguish, for instance, reading on a dedicated e-reader (without the siren call of Facebook or hyperlinks) from reading on your laptop. Nor is there anything to distinguish casually reading on your phone’s tiny screen from reading at your computer, or sitting on the couch and reading on a book-sized tablet. Personally, I’ve found display size to be the biggest factor in maintaining attention. I get tired of reading on my phone, and I tend to skim on a desktop or laptop, but a handheld tablet (I have a Nexus 7, which is close to the size of a paperback book) works out about right. I’d much rather read a long article on that tablet than on a computer, even with the browser window sized for optimal column width. So yeah, it’s much easier to concentrate on something long in a book than on a desktop or cell phone…but an ebook reader or a tablet is a lot closer. The main problem I do have with a tablet isn’t continuing to read, but starting to read. Even without a wifi signal, it’s tempting to catch up on email, or saved articles in Pocket, and before I know it, I’m done with lunch and I haven’t even opened the book I’d planned on reading. This entry was posted in Computers/Internet, Highlights and tagged mobile, reading, tablet on April 7, 2014 by Kelson. 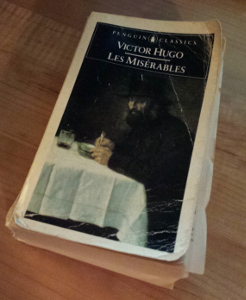 It’s been a month since I finished re-reading Les Miserables, and I’m still working on finishing the commentary. I’ve been making an effort to include actual reactions, not just summary, which is one of the problems I’ve had since switching to the kindle and relying on highlights instead of writing my own notes as I go. I’m making progress. In the past week I’ve added the following three sections covering 100 pages from 883 to 984 two weeks I’ve added the following sections covering about 200 pages. UPDATE (12/31): I’m finished! A Revolting Development – Barricade day arrives, the city really does erupt (this barricade is a small part of a bigger rebellion), and Gavroche isn’t taking things seriously. (From) Drinking to Revolution – Grantaire, Laigle and Joly spend the day in a tavern ignoring the revolt, so when the rest of the students show up, they figure, hey, let’s build our barricade here! Also, Javert isn’t the only infiltrator, and Marius tries to figure out the best way to die. Hey Barricade, Who’s in Charge Here? The first attack and deaths. Marius arrives, guns blazing. (Who knew he could shoot?) Eponine dies. Valjean finds out that Cosette’s been seeing someone, and he’s not happy about it. Barricades of Future Past (Plus Cannon Geekery) – A look at the 1948 revolt, sending fathers home who don’t want to go, geeking out over the army’s new cannon, and Valjean’s marksmanship. Passing Peak Ammunition – The barricade manages to hold out, but loses Gavroche and their star prisoner. Last Stand – Storming the barricade and tavern. What a Wonderful Smell You’ve Discovered – Valjean carries Marius out of the war zone through the sewers. Jumper – Javert doesn’t handle cognitive dissonance very well. Don’t Worry, Be Happy – Marius comes out of his coma, and he and Cosette can finally be together. What could go wrong? This is the End – The wedding is a new beginning for Marius and Cosette, but it’s the beginning of the end for Jean Valjean. Fortunately, Thenardier tries to blackmail the happy couple. 75 pages of the barricade battle. I’ve already written up the flight through the sewers and Javert’s suicide. I’ve written about 75% of the last 90 pages (out of order, so I can’t just put numbers on it): Marius’ convalescence, the wedding, the blackmail attempt, Valjean’s separation from Cosette and his death. So I’ve got about 100 pages to cover, probably in 5 chunks, and just over a week before the end of the year. I think I actually have a chance of making this goal! This entry was posted in Entertainment and tagged Les Miserables, reading on December 23, 2013 by Kelson. Last week I finished re-reading Les Misérables. I’ve been working on this off and on for most of the year, taking breaks to read other books along the way. I don’t feel finished yet, though, because I set myself the challenge of commenting on the whole thing as well, and I’m way behind on that. The main problem is that when I switched from carrying around the rapidly disintegrating copy of the book to reading on the tablet, I also switched from writing notes on my phone to highlighting passages in the Kindle app, with the idea that I’d write my commentary later. You can build on digital notes. With highlights, you have to do all your composition new, so my commentary started taking longer to write…and the longer it went, the less fresh those chapters were in my memory, and the more my commentary began to resemble summaries. I did manage to write two commentaries right within days of finishing the chapters: the sewers, and Javert’s suicide. But I can’t post them until I get to that point. Today I finished a new section of commenatry. This covers Marius and Cosette’s six weeks of secret meetings in her garden (during which Hugo is very insistent that nothing is going on), Eponine staring down hardened criminals with an awesome “You think I’m scared of you?” speech, Marius trying — and failing — to reconcile with his estranged grandfather, and what they’re all up to in the days (or in Marius’ case, the daze) before the revolt. That brings me up to page 882 out of 1201 (not counting the appendices, which I’ve already covered). There’s about 180 pages to cover, the entire barricade sequence, before I can post the sewer commentary I’ve already written. I’m no longer certain I’ll be able to finish it all by the end of the year, but I’ve at least got a shot. Um, so to speak. Read on for the new commentary, Over the Edge. This entry was posted in Entertainment and tagged Les Miserables, NaBloPoMo, NaBloPoMo 2013, reading on November 29, 2013 by Kelson.